Last month I was contacted by Courtney (from the blog, A Little Glass Box) who wanted to see if I could make her a clown costume with a very vintage feel. She had her heart set on striped and polka-dotted combination of black and an aged looking-white and was wondering if I could do some tea staining to get the look she was wanting. Even though I had not done any tea staining before, I was ready and excited for the challenge! After I looked all over the web for tutorials, I found that nearly every one said different things about how to tea stain, however, they each made it clear that I needed to be careful in selecting what kind of tea I would use for my task. I had never thought about it before, but it made sense that since every type of tea has it's own hue, that they would all stain your fabric different colors. From all the research I did, it was clear that for the type of look I was wanting, I would need black tea since it finishes with a very antique-y look which would be perfect for the vintage feel of Courtney's costume. Before I jumped it, I decided to test the process on a small piece of my black and white fabric. I strongly recommend this since. I did this by filling one small mason jar with hot water and adding two bags of tea. Thankfully, it worked just fine so I moved forward. Once my water was boiling, I poured it into a medium-sized bucket that I placed in my sink. Since I had over a yard of fabric to stain, I wanted to make sure that I had plenty of room for my fabric to move while I stirred it around (so that it would have a uniform stain). I added more hot water from the tap till I filled the entire bucket. Then I started adding tea bags the mixture looked dark enough (I added about 12 bags of tea to my bucket of water. I read in here that it should be about one bag of tea per cup of water but I found that it didn't need to be that concentrated since the look I was going for was more of a softer creamy white). Once I got the color I thought I wanted, I pulled the bags out of the water and threw my wet fabric in the mix, stirring constantly. Most of what I read said that I should let it stay in the tea bath for 30-40 mintues, but since I was going for such a light look, I thought that I should stay vigulant and continually check the color of the fabric. I am glad I did because it only took about 6 minutes before I liked what I saw. It should be noted that the color looks darker while it is wet. After I got my color, I pulled the fabric out of the tea bath and rinsed it on cold with a little bit of dish soap. I then tossed it in the dryer and hoped for the best. Hot dog! I got the exact color I was hoping for (I was trying to match a black and off white striped fabric that I was going to be using for the costume as well so the stakes were high) and I was filled with relief! Luckily, Courtney liked how the tea staining worked out as well and now her adorable little boy is all set for Halloween. Courtney sent me this picture of her little man. What a cutie-patootie! By the way, you should check out Courtney's blog, Little Glass Box. She has so many cute ideas over there. I can't wait to try out this one. Thank you Courtney for taking a leap of faith with me and good luck everyone on any future tea staining projects. I hope this helped! This is so wonderful! I never knew how to do this--very informative! 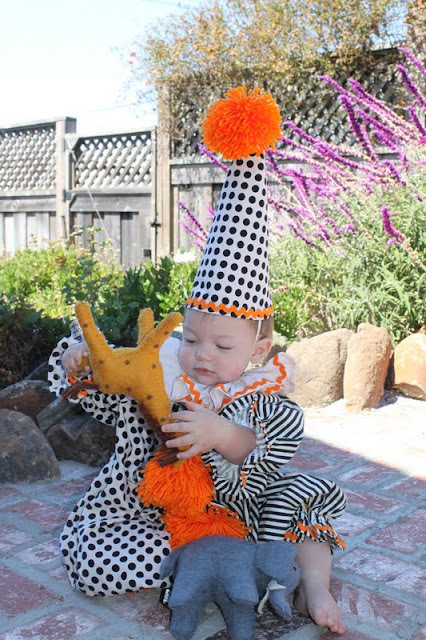 The clown costume is adorable, by the way! You are one creative person! I would love to have you share this at Show & Share! What a great tutorial! The costume turned out darling! Thanks so much for linking up with us at Show & Share! GReat tutorial and your finished project turned out so fab! I love the vintage Halloween look!! Great tutorial and that costume is just darling! what an adorable clown costume! i'm featuring it tomorrow! thanks for joining the Fall Frenzy party! Hi, Thankyou for the very inspiring tutorial. Did some experiments with coffee and different types of tea on small squares of fabric - taking note of the strength of the tea and how long it was left and what it dried like to find best colour - trying to get a sepia effect. Then had a go tea staining some untreated silk twill with no coating whatsoever (from Whaleys in UK - specialist place for textile artists) to exactly match the background of a silk twill fabric lining I had digitally printed as part of a fashion design project I am doing and found it worked beautifully. I used a slow cooker and had about 8 or so rooibush tea bags (with a very subtle red tinge)in it and used your strategies of wetting it first and stirring it a lot to get an even effect. Also added salt and vinegar to it to be sure it does not wash out but will be dry clean in any case.